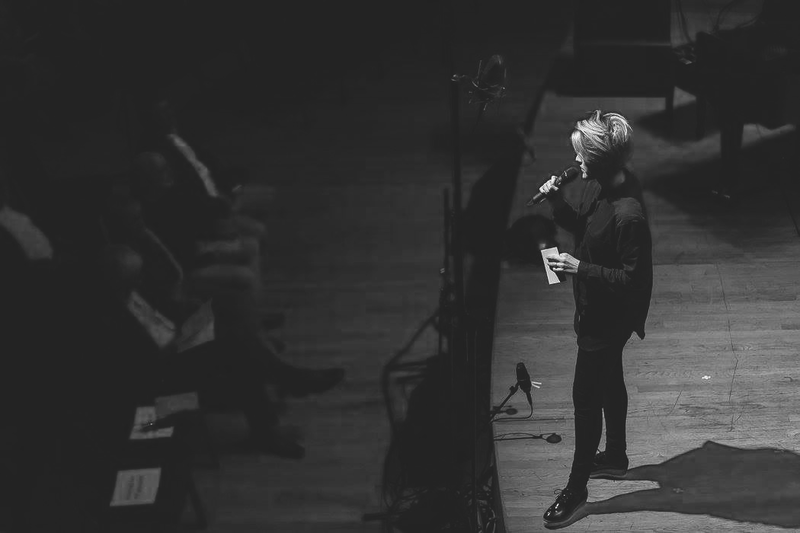 Lucy addressing the audience at Resonant Bodies Festival 2017 at Roulette. Photo by Gretchen Robinette. On September 11, 12, and 13, Roulette will host the sixth Resonant Bodies Festival. The festival gives outstanding and inventive vocalists, regardless of genre, 45 minutes of stage time to fill however they want. We asked founder and curator Lucy Dhegrae to talk about the performers on this year’s program and how she goes about filling the bill. Kurt Gottschalk: Composer and singer Paul Pinto’s operas owe a stylistic debt to Robert Ashley but with a near-future, dystopian vision that reminds me of Margaret Atwood’s fiction. His productions can be really funny. They can also be really foreboding. Do you think he’s a cynical humorist or a humorous cynic? Lucy Dhegrae: I would say…cynical humorist! Paul is an extremely lovely and hilarious person, so I would say he is a humorist first, cynic second. Paul has virtuosic stage charisma. His energy is infectious. I think the work he is bringing for ResBods is more on the serious side, though I am sure Paul will defy expectations—which is part of why I love his work. KG: Helga Davis sang in the 25th anniversary staging of Philip Glass’s seminal Einstein on the Beach and has worked with director Peter Greenaway and composers Missy Mazzoli and Paola Prestini, to name a few. She’s also been likened to the great jazz singer Jeanne Lee and regularly collaborates with Davóne Tines, whose set of gospel songs at last year’s Resonant Bodies was as staggering as it was unexpected. What appeals to you about Davis’s work and how do you see Resonant Bodies crossing between, on the one hand, art song and contemporary composition and, on the other, jazz and gospel? LD: Helga is first and foremost a powerful voice and stage presence. I would be excited to see her do pretty much anything on stage, and that is the foremost quality I look for in any artist for the festival—an amazing performer. Her work defies genre and classification, and that too makes her perfectly at home in ResBods. What I would like us all to focus on, for this festival and all Resonant Bodies festivals, is not genre or even aesthetics: it’s the person. I want us to get to know the person not only based on the sound of their voice or the mode in which they present, but in how they present their work, whom they collaborate with, and what makes them light up on stage. Every performer on the festival has a magic, but no two performers possess the same magic. There is no universal experience of the voice, no one right way to do it. What is such a delight for me as an audience member is to see someone who wants to be there, sharing something with us that is important to them, something they love. When you ask talented performers to do this, to me—it doesn’t get any better than that. KG: Jen Shyu is truly a multi-talent, a composer and a dancer who sings in multiple languages. On top of that, she plays violin, piano, and several East Asian string instruments—all instruments that themselves have resonant bodies, as it happens. How do you weigh all the different job titles (composer, instrumentalist) that the singers you present possess? LD: The voice is so fascinating to me because of how it manifests itself through the individual: through their physical body, but also through each person’s history and experiences. In addition to Jen’s training in a variety of instruments, she has also trained in vocal styles that accompany the instruments. You can hear the multifaceted stylistic approach in her voice: virtuosic timbre! She is one of the rare performers who embodies a variety of approaches to the voice from dozens of influences. So thrilled she can be a part of this year’s festival. KG: Nathalie Joachim has worked in classical, hip hop, jazz, indie-rock, and electronic music. She’s also a member of the Grammy-winning chamber ensemble Eighth Blackbird and has performed at the Bang on a Can Marathon with her duo Flutronix. I understand that you don’t put any restrictions on the performers, but do you think the festival has a particular aesthetic? LD: Our motto is “curated unpredictability”—I myself am very much an aesthetic omnivore, and I like that our artists (like Nathalie) are too. We’re a home for artists who don’t belong to any one genre. The music world is a geography: artists are metropoles. Genre and aesthetic interests travel through and around the artists like roadways, but they are not the destination. I know that’s a giant metaphor, but this idea of Resonant Bodies illuminating the “map” of the adventurous vocal world is part of the function that we serve in the community. We can’t possibly show the whole map, or even conceive of its entirety, but we can begin to know it by presenting individuals who have their own unique domain. I think also by covering a greater literal geography with the festival, year by year we can bring together some of the various parts. Spoken word, beatboxing, rap—I’m interested in and open to presenting these in the future. KG: Caroline Shaw is getting to be a well-known name. She’s the youngest-ever recipient of the Pulitzer Prize for Music and she’s built quite a following over the last few years and I’m sure will be one of the more anticipated sets on the program. But I’m sure it’s more than a prestige booking. What made you want to include her on the program? LD: I think most people know Caroline as a composer, violinist, and/or ensemble singer, but probably many of them don’t know her as much as a solo vocalist. She is hugely talented, and I wanted to see what she would do with the prompt of “here’s 45 minutes: approach this space as a solo vocalist.” As one of her fans, I’m really looking forward to hearing her on the festival! I know she has been developing this material for a while, and I am so grateful to her for cooking up something special just for ResBods. KG: The German soprano Sarah Maria Sun put out a truly remarkable record on Mode Records, performing challenging works by Heinz Holliger, Salvatore Sciarrino, György Kurtág and others. At Roulette, she’ll be presenting a very different program, with works by Georges Aperghis and Rebecca Saunders, among others. I wonder if you could say something about what virtuosity means to a singer and what it means to you as a curator. LD: Vocal virtuosity was probably my starting place as a curator. And there are many kinds of virtuosos in singing: virtuosic range, dynamic control, language, character, timbre, stylistic flexibility, emotional communication, audience interaction and so on. Sarah is not only a virtuoso in many of these aspects, but she has the added bonus of being completely compelling and vulnerable on stage. Virtuosity is totally worthless if one doesn’t have that, and Sarah has it in spades. I’ve been a huge fan of hers for almost a decade so I am over the moon that she is able to join us on this year’s fest. KG: Pamela Z is an artist well known to Roulette audiences; she’s appeared on Roulette’s stages a number of times over the years and is a forerunner in working with voice and electronics. Do you think electronics is still a novelty in new music? Is it a crutch? Or is it just a more versatile piano that’s easier to move around? LD: I think electronics (in all its different forms) is an instrument, and Pamela Z is a modern master of that instrument. She is a great example of someone actually performing with electronics. She’s not staring dull-eyed at a laptop; she is a wizard casting a spell. Is the piano a crutch for Elton John? Is the guitar a crutch for Jimi Hendrix? In an interview I did with Jennifer Walshe for the 2017 Festival, I asked her about the line in her New Discipline (non)manifesto that mentions “maintain[ing] sexualised eye contact with audience members whilst manipulating electronics”—while this is kind of a joke, it’s also serious. Jen recognizes how difficult it is to manipulate electronics on stage in a way that keeps the audience engaged with the performance. Pamela Z has mastered this. I bow down to her artistry! KG: Gelsey Bell is another name familiar in these circles. She was an artist-in-residence at Roulette in 2015 and has been commissioned by Roulette with the Jerome Foundation. She’s also recorded works by Robert Ashley and John Cage and last year released an album with violist and composer John King. To say she’s a name to watch out for would be to put it mildly. No doubt she deserves the attention she’s received, but what do you think accounts for her star power? LD: There are some people who, when they walk out on stage, without singing a note or saying anything, I just instantly fall in love with them. Gelsey is one of these performers. When she’s on stage, you feel her excitement to be there, and you feel her genuine curiosity and commitment to what she’s performing. This seems so simple, but it’s one of the most important tools of a good performer: the ability to reach down within yourself and connect to your love of the thing. It’s almost child-like. And it’s completely disarming for me as an audience member. The performer proceeds with (seemingly) zero self-consciousness, and so do we. Gelsey’s work pioneers new sounds from a place of love and joy, and it’s just a pleasure to take in. KG: Last but certainly not least, we get to one Lucy Dhegrae. As a curator and producer, how do you decide when to include yourself on a bill and what can we expect from your appearance on the festival’s opening night? LD: The first year we did Resonant Bodies, I performed as well as produced/curated, and while it was thrilling, it was also physically exhausting and not sustainable year after year. I swore I wouldn’t perform on the festival again until I had lots of staff support and I felt like I had something really special to share. I feel ready for this year’s festival because both of those criteria are met. Resonant Bodies is by no means my vanity project; it is very much built by and for a community of curious vocalists. It is a lot to get up on that stage and share your heart and soul—a precious gift that an artist shares with the Festival and the audience. I can only be a proper steward of that gift if I myself go through it. I will be making music with friends new and old on stage, presenting new works as well as ones I am familiar with. Looking back at 2013, I feel I have changed and grown so much as an artist since then, and I am excited to invite the audience into my musical microcosm for 45 minutes. Kurt Gottschalk writes about contemporary composition and improvisation for DownBeat, The New York City Jazz Record, The Wire, Time Out New York, and other publications and has produced and hosted the Miniature Minotaurs radio program on WFMU for the last ten years.